Spruce Knob Association has it all! Located in the beautiful cental Allegheny mountains of Pennsylvania our homes and homesites enjoy the best attributes of a mountain community. Homesites range from 2500' - 3000' of elevation and offer a world of difference from life below. Check out Blue Knob on Facebook! Blue Knob Facebook site - Click here. Cross County Skiing - we offer miles of groomed and ungroomed XC trails right out your back door! 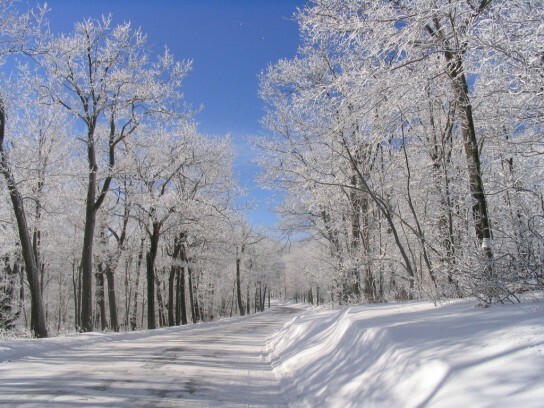 And if that is not enough, Blue Knob State Park is just over the mountain top and it's 5614 acres offer many more miles of ungroomed trails for the adventurous XC skier. Golf - our 9 hole mountain course offers some of the most challenging golf links anywhere. Many of our lots and homesites line the beautiful tree lined par 4 course. Hiking - the XC trails and State Park trails offer many mile of less traveled roads. Mountain Biking - Many miles of trails up and down the mountain will challenge the best of riders! Tennis - two outdoor tennis courts give you the chance to show your style or sharpen your skills. Swimming - both outdoor and indoor pools & hot tubs are great, no matter what the weather. Relaxing - the peace and quiet of life on the mountain offer the perfect setting for a relaxing afternoon on the deck, enjoying a cold or warm drink (depending on how much snow is on the ground!) or that good book you are looking forward to finishing. History - Did you know that Blue Knob was an Air Defense Radar Station before it was a ski area? Blue Knob on Youtube - great videos! Ski, board & bike videos - click here. Want a peak at the past? This is the original 1982 promotional video for Blue Knob All Seasons Resort. - Click here.